Every magazine student must complete a senior capstone course before graduation. In the past, The Magazine Program has offered two capstones: 515 and Think. In the fall semester of 2010, seniors chose to undertake a new challenge in creating the all-digital Urban Plainsmagazine. The students in each course work as a staff to craft a publication, including all editorial, design, circulation, promotion, marketing, distribution and ancillary activities such as a website. 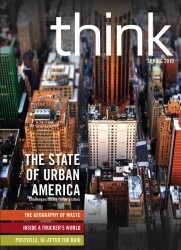 Think is a newsmagazine that results from the combined efforts of Magazine and News/Internet majors. The magazine aims to engage, entertain and inform. Think holds products, businesses and the government accountable. The magazine digs deeper and does it with intelligence, optimism, realism and wit. Students cover topics from money and health and politics to the environment, art and technology. They also produce new material for the magazine’s Web site. In the fall of 2010, Drake University magazine majors decided to ditch the tried-and-true formula of 515 Magazine for a new pursuit. The result was Urban Plains, which flaunts the “lifestyles of the flyover states.” They cover everything from food to body art to sexcapades in the Midwest’s biggest cities. The catch: it’s all digital. The staff elected to forgo print in pursuit of a larger, more national audience. Read the inaugural issue here and download the latest edition from the App Store now. 515magazine is an award-winning guide to culture, arts, and trends in Iowa’s dynamic state capital, Des Moines. The lifestyle magazine targets young professionals and the hippest, most insightful, forward-thinking movers and shakers in our region. Students use focus groups to better understand the needs of 25- to 32-year-old readers in Des Moines, then they develop an editorial plan to serve those readers. The class also produces new material for the magazine’s Web site.